For more than a decade, four Elon University professors have been riding to and from work together in an effort to make their 40-plus minute drive more interesting. Only 18.3 percent of Americans, on average, carpool to work daily, according to Associated Content, citing 2005 statistics. 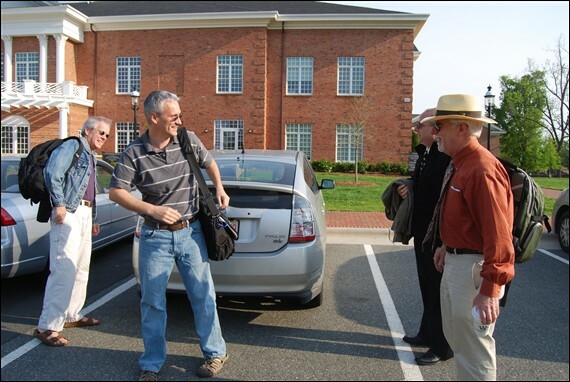 But Elon professors Paul Miller, Jeffrey Pugh, Steve DeLoach and Tom Tiemann have met for years in Carrboro or Chapel Hill to make the trek to work every day. Next to join was fellow economics professor DeLoach, who said he appreciated the offer from a senior faculty member for a mentoring opportunity. Tiemann and DeLoach estimate they carpooled together for roughly a year before Pugh joined them. Pugh, a religious studies professor, had recently moved to the Chapel Hill area. The final member, Miller, joined two weeks into his second year as an Elon professor. He was looking for a ride into Elon when he looked up DeLoach’s contact information. DeLoach said there was a longstanding carpool, and asked Miller. The car pool of four, as it stands, has been relatively unchanged for 13 years. “One of the things that makes it work is we don’t get too hung up on everyone being in the car pool every day,” Tiemann said. He also said economics professor Mark Kurt occasionally fills in for a member when someone can’t make it. Each professor trades off driving nearly every day so no one has to do the bulk of the driving. But, scheduling sometimes rearranges the dynamic. “The best is when we trade off every day, but it doesn’t always work out that way, so you have to be flexible,” Pugh said. Both economics professors, Tiemann and DeLoach spoke about the career and social advancement aspects of the car pool. Pugh said he will discuss book ideas with the car pool and a few of the professors have collaborated on research. But ultimately, they say they are foremost friends that make the sometimes two-hour round-trip ride go faster. “Sometimes, when I’m in the car pool, it’s the best two hours of my day,” Miller said, laughing. Miller has spoken a few times at Elon’s Turning 21 dinners and to other professors and students about the importance of the social aspect of carpooling. “Aw, I’m getting verklempt,” Pugh said. “Sometimes life can be isolating. You go home, you go to work, you go home – that’s it. The car pool is for us a way to not be isolated from human community,” he continued. Three of the four professors drive Prii, which stretches their carpooling dollar even further. Tiemann, though he is the professor without a Prius, said he appreciates the weight off of his wallet. “We’re glad we’re saving gas for sure, both for our own pockets and the environment,” he said. DeLoach said partially thanks to the car pool he and his wife were able to live with one car for 12 years before buying another. He bought his Prius in 2005. Miller, Pugh, DeLoach and Tiemann have all become good friends outside of work and travel thanks to the car pool. The weekly hours of “Seinfeld-esque” banter that DeLoach speaks of has translated into valued friendships for the professors.